The heat has passed, yet the bustling of a summer city continues. 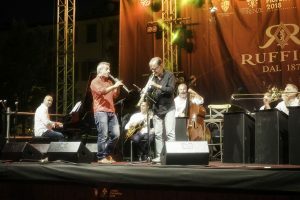 In fact, it is accentuated by the multi-locational jazz festival in the Oltrarno quarter. 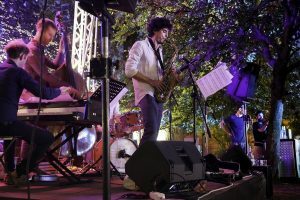 The Firenze Jazz Fringe Festival brought the best Italian and international jazz musicians to the city for four nights of incredible performances. The curators of this festival worked hard to emphasize the historical significance of the city as a stage. Performances took place in Piazza del Carmine, Piazza Santo Spirito, the Ponte Vecchio and Porta San Niccolò. 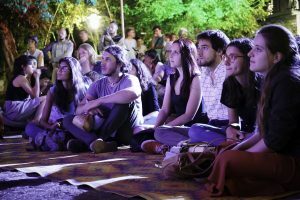 Other performances were held in café gardens and basements. Music filled the streets with contagious beauty. Featured in the first photograph is the Michele Tino Quartet. The saxophonist Michele Tino is native to Tuscany and on this night, the quartet debuted their never-before-heard project. The syncopation, rhythm and tone of their group hypnotized the audience. Their sound was full-bodied, warm and exciting. I was elated. 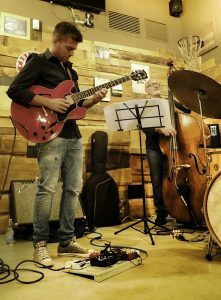 The following night, another young, native Tuscan musician performed with his trio. Featured in the third image is Francesco Zampini on guitar, Raffaella Pareti on bass, and Walter Paoli on the drums. Their set began with traditional jazz and grew into an insane fusion of psychedelic rock and deep improvisation. The crowd roared with joy. On Sunday, I found a ten-member orchestra performing in Piazza del Carmine. The clarinetist Nico Gori directed the group Swing10tet. There was a dance floor before the stage where a tap dancer made a musical collaboration with the orchestra, and the singers out-shined the many colored lights. 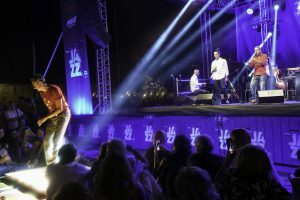 This group effortlessly laced traditional jazz songs with their electric energy. Jazz speaks for life. Improvisation rejoices in the unknown and keeps one on their toes. It is like how we create our own unique and individual path. From the beginning, music has aided one in the rhythm of this dance and continues to shape our lives forever. Piera is an SAI Florence fall 2018 student from Sierra Nevada College.